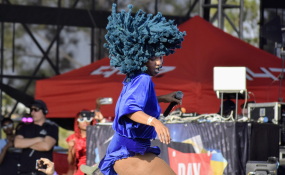 Sanelisiwe Twisha, better known as Moonchild Sanelly, took the stage at the 2019 Coachella Valley Music and Arts Festival in California to show the world that Africa has talent. She gave a stellar performance of her hit song iWalk Ye Phara and had the crowd dancing along to her irresistible and charming vibe. She performed as part of popular U.S. DJ Diplo's set. Moonchild showed off her incredible moves and vocals that let the crowd know why she's a force to be reckoned with. She kept true to her image, wearing her signature blue hair and setting the dance floor on fire. She posted on social media to share her joy with a caption: Boobeams💙 My life was made. As one of the surprises acts on @MAJORLAZER set @coachella. Moonchild Sanelly becomes the first South African woman to perform at one of the world's greatest festivals, and she made the country proud. Thembisa Mdoda - Seeing Moonchild on that @coachella stage 😍😭😍😭😍😭. What a time 🔥🔥🔥🔥🔥!!! If you aren't familiar with any of her music, don't worry we got you - listen to some of her songs - Midnight Starring and Makhe.